In 2002 Lyse established a gas pipeline from Kårstø to Risavika. 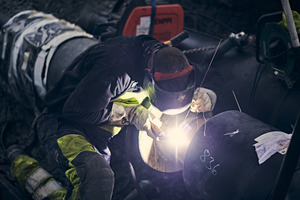 From this pipeline a finely meshed gas network has been developed in Sør-Rogaland of around 600 kilometres. The gas network is used to deliver natural gas to industrial customers, about 600 GWh per year. The gas network is also important for utilising Sør-Rogaland's potential for biogas. Sewage in the region is currently converted to biogas by the company IVAR. Thus far biogas represents four per cent of the gas in the network. Plans have been made to increase the proportion of biogas to 15 per cent in the first phase. Due to the farming in Jæren, Sør-Rogaland has the greatest biogas generation potential in Norway. The gas pipeline from Kårstø also carries natural gas to Lyse's LNG plant in Risavika. At the end of 2012 Lyse had invested about NOK 1.75 billion in the LNG plant, the receiving terminal in Lysekil in Sweden and related infrastructure. After a slightly slow start during the financial crisis, there is now strong demand for LNG. Skangas has signed a number of new contracts in recent years for the sale of LNG. Skangas was founded i 2007 and is now owned by Lyse (49%) and finnish Gasum Corporation (51%The customers are industrial customers in Sweden and, to a strongly increasing degree, the maritime industry in Norway. The business is currently looking into opportunities to utilise the remaining capacity in the logistics system to deliver LNG to even more customers, as the demand is large. LNG is the fuel of the future for vessels with significantly lower environmental emissions than other fossil fuels. Many LNG vessels are under construction and more vessels are being re-built. In addition, the EU has announced that all important harbours shall be adapted for bunkering LNG. This will apply to over 100 harbours and could create even more demand in the LNG market. Thus Skangass is well positioned to take an important part of the market.